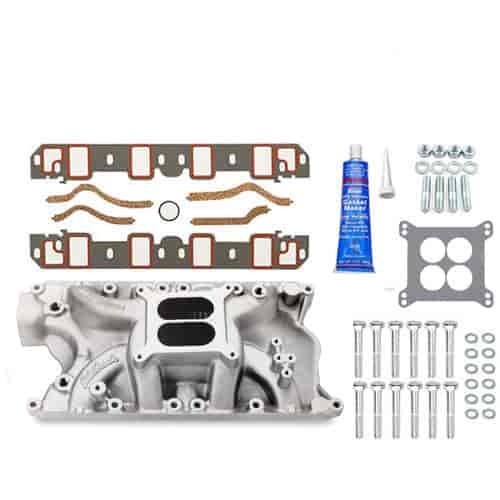 Designed for 1969 and later 351ci Windsor Ford V8 high-performance engines with Edelbrock Performer RPM cylinder heads, modified OEM (12- or 16-bolt) cylinder heads or equivalent. The dual-plane design offers good throttle response with excellent top-end power for the street. Includes bosses for rear water crossover. Will fit 1964-1/2 to 1970 Mustangs. Will not fit under stock hood of 1974-78 or 1979-95 Mustangs. Aftermarket 4-bbl carbs are not compatible with Ford Auto Overdrive Transmission (AOD) unless used with Lokar throttle cable bracket & springs p/n 625-SRK-4000. Carb pad height = 4.80'' Click here to determine carburetor pad height. This will fit the 351W engine and is a good choice to use with an EFI kit.